When it comes to picking one of AT&T’s smartphones, the choice has always been clear: the Apple iPhone. While other phones such as the BlackBerry are available on the network, none really stand out in comparison. If you were to buy an AT&T phone today, the selection process will likely come down to the iPhone 4, which has sparked yet another media frenzy. But for some customers, that’s about to change. While AT&T’s first Android smartphone, the Motorola Backflip, was far from being a worthy device, the company’s two latest offerings are worth considering: the Samsung Captivate and the HTC Aria. Both devices run on Google’s latest Android v2.1 mobile OS and hope to steal some attention. The Captivate is part of the Samsung’s Galaxy S family of smartphones. While Android 2.1 is an important aspect, its highlighted feature is its beautiful 4-inch AMOLED display which consumes less power and provides a more colorful viewing experience. While AMOLED displays often face outdoor visibility issues, Samsung’s Super AMOLED hopes to solve that. And that’s not all, with a snappy 1 GHz hummingbird processor, this phone is perfect for graphics intensive applications. It is also capable of full 720p HD video recording with a 5 megapixel camera. The Captivate also sports a six-axis sensor for tilt sensitive apps, along with a built-in accelerometer, gyroscope, and GPS. The HTC Aria is the perfect blend of price-per performance. It’s smaller than most smartphones with a 3.2-inch HVGA display with a capacitive touchscreen as well as an optical joystick. It features HTC’s Sense UI overlay for Android, which phones such as the HTC EVO and Droid Incredible also offer . The Aria also has a 5 megapixel camera, but it isn’t clear whether it supports 720p recordings just yet. HTC interface also provides a built-in window to check and update social networks such as Facebook, Flickr, and Twitter. While pricing and availability isn’t yet available for the Samsung Captivate, we do know that the HTC Aria will be available on June 20 in AT&T retail stores and online. As for price, it’s going to sell for $129 after a $100 mail in rebate and signing a new two-year contract. With an affordable price tag, there’s a good chance that the HTC Aria will establish a share of the lower-end smartphone arena. 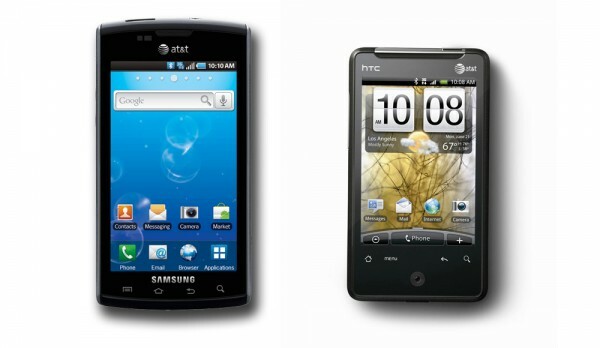 With that said, the iPhone 4, Droid Incredible, and HTC Evo 4G have already set a new standard for smartphones in the industry. And of course, Verizon Wireless has the Motorola Droid X in the pipeline with an announcement coming this week. It is clear however that the Captivate and Aria offer consumers a strong alternative to the Apple iPhone on AT&T’s network. Editors Note: This article was edited by Santhi Vinnakota and Sahas Katta.